Light: Motivating yourself with images of future success. Using visualization to encourage progress. Taking an imaginative or creative approach to problem solving. Making dreams come true. Gleaning insight from personal visions. Shadow: Obsessing on imaginary fears or uncertain consequences. Giving in to emotional or political terrorism. Spending more time dreaming than working. Failing to envision the possible repercussions of your choices. Being controlled by fear. Story: The Main Character is hindered by unreasonable expectations or unfounded fears. Alternatively, the Main Character insists on remaining true to his or her original vision. Relationships. Comparing your friendships and relationships to unrealistic, Hollywood-produced fantasies is a sure-fire formula for disappointment. Rather than imagine what things ought to be, face how things are…and then take the steps necessary to make your relationships more rewarding. Work. Plan for contingencies. At the same time, don’t allow “what might be” to distract you from “what is.” Unless it’s your job to build castles in the sky, be sure to invest more effort in hard work than sweet dreams. Spirituality. Use meditation and prayer to build a clear vision of your spiritual goals, and call on this for inspiration in times of need. Pay attention to dreams; they have important messages for you. Personal Growth. Your imagination is a powerful tool, capable of shaping your experience and your world. Focus your thoughts. See life as it should be, and then take personal responsibility for making your dreams come true. Always link imagination with action! Fortune Telling. You’re being fed a line. Rather than be dazzled by fancy words and promises, demand something real. When? Between November 13th and 22nd. Contents of the Cups. On RWS-inspired decks, we often see cups laden with all manner of intriguing options: masks, serpents, wreaths, jewels, elemental symbols, shrouded figures. Be aware of your fears and your motivations, and act accordingly. Dangers and Surprises. In your situation, what is the worst possible outcome? What’s the best possible outcome? How are hopes and fears shaping your thoughts about the challenge of the moment? Dreaming isn’t Enough. As engaging as dreams and fantasies can be, imagination without action is wasted energy. How might things change if you fantasized less about outcomes and more about new ways to take action? The Marseilles Image. 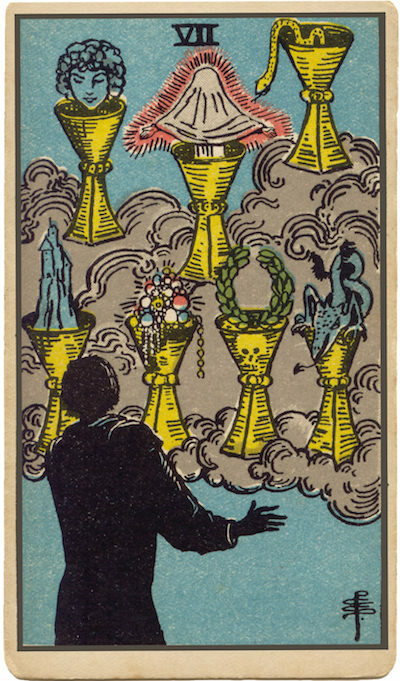 The arrangement of Cups seen here suggests a conflict between opportunity (the one, central cup) and uncertain feelings (the two sets of three). What do you need in order to shift confidently from imagination to action? Until you know, growth will be limited. What do you want most? What do you fear most? How are these related? How is your imagination working for you? Against you? How might a clearer personal vision help you choose a single cup from the many available?